Airbnb is one of the most popular platforms to rent out your holiday home. When you have decided you wanted to rent out your property, you will have looked at easy ways to get more bookings and what is needed to get your property up to standard. However, there are always things that can be improved in order to make your holiday home even more popular. We have put together some tips that are made sure you get the most out of your property! Outdoor spaces such as gardens and patios are very easily overlooked, especially in rental homes. However, these are an important part of the property and should fit in naturally with the style of your interior. Consider what type of property you have: Do you get more bookings in the summertime? Think about creating space for a barbecue. More of an autumnal/wintery vibe in your property? It could be worth considering installing a hot tub. These can be pricey, but this also means you can increase your rental charge! Even if your property does not have an outdoor space, ensure you keep windows clean and install some hanging baskets on your balcony or wall to make your home more welcoming for guests. One way to increase your ‘rentability’ without much effort, is by installing stairlifts where needed. Rental homes are often used for family holidays and by installing a stairlift, you ensure that your home is accessible for the entire family. People with less mobility or seniors can get up stairs easier and this will widen your range of guests. Make sure to take photos and/or put this feature in your description of the property for clarity! Another tip is to create a bedroom on the ground floor level if you have the space. A survey undertaken by TripAdvisor found that 83% of respondents said that their biggest cost saving was the ability to cook in their rental property. A kitchen remodel is a no-brainer when it comes to your property. Not only is it one of the most important features for guests coming to stay, it is also a room in the house that makes up for a large percentage of its value! It contributes to the long-term value of the property and will help you get more bookings. Interior design can be a tricky thing in a rental home. It should be neutral enough for most people to enjoy, but the property should also have personal features that make it quirky and special. Again, consider the setting of your property. If it is located by the sea, you could think about bringing this back into the accessories of the home, like adding some blue cushions and sea-themed trinkets. Adding items that look luxurious whilst keeping it neutral and tidy will contribute to your guests visit. Hosts can easily overlook storage space for visitors in their rental home. By making your home too photogenic, you might overlook practical spaces where guests can store items. Even if you mostly have short-stays, storage is still important for your guests. Consider both hanging space and shelves for clothes storage in the bedroom as well as a cupboard with some spare linen. Also, make sure you have space in the bathroom for guest’s toiletries and extra towels. In the hallway, have a rail for coats and a shelf for shoes. In your rental home, you want to limit the number of personal pictures or any religious items. Make the decor homely by adding some blankets, cushions and candles, without making it too personal. Especially in the kitchen and bathroom, you might like to add essentials that are used on a daily basis. Sugar, coffee/tea and olive oil or butter are staples that your guests will appreciate in the kitchen, as well as some basic cleaning supplies! In the bathroom, you can leave a couple extra toothbrushes, cotton buds and some basic shampoo/body wash. If you are really invested in getting 5-star reviews, you can leave a basket with some local items for when your guests arrive, like eggs, some beer and maps with local attractions. 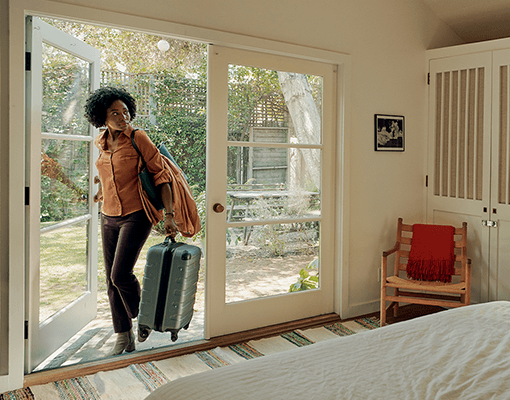 These few easy tips will help you improve your ‘rentability’ on Airbnb or any rental holiday home platform. It is important to keep your property accessible to all kinds of guests. Keep a neutral look, whilst having plenty of luxurious features and you will make your rental property a success!